Click on the yellow ‘Donate’ button <<<< to make a donation online via PayPal secure payments. Send a donation by post made payable to ‘Hedgehog Care’. 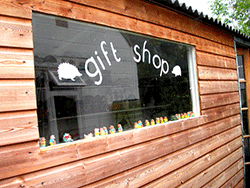 Visit the hospital, the ‘Hogsfam’ charity shop and the gift shop. Support the annual ‘Mrs Tiggywinkle’s Washing Line Sale’ in February – jumble, bric-a-brac, books, tombola, raffle, refreshments, peep at the patients and more. Organise and/or attend a fundraising event. Donate tissues, toilet tissues and/or kitchen rolls (not just the inner cardboard bit). Donate tins of dog/cat food (not fish or pork flavoured). Volunteer to make hedgehog hibernating boxes from this plan. Donate pet-safe timber treatment, even half an old can will help. Hedgehog Care - The Movie!